Author Laurel Snyder has witnessed her share of corn fields. For a time she lived in Iowa, surrounded by plenty of corn. After all, Iowa does produce the largest corn crop every year. In her middle grade book, Any Which Wall, four curious, school-aged children from fictional Quiet Falls, Iowa, pedal their bikes to nowhere in particular and end up exploring a cornfield. In the middle of the cornfield they discover a large, "precarious" stone wall. Soon they realize that the wall isn't ordinary; in fact, the wall is magical. It has the power to take the kids most anywhere they wish - any time, any place. They visit interesting and dangerous places, like a pirate's home, a pioneer settlement and Camelot, where they meet the wizard Merlin. Along the way, the children (two sets of siblings: Emma and Henry & Roy and Susan) find that magic exists even in the commonest of places. They also learn that growing up does not mean having to let go of your imagination. 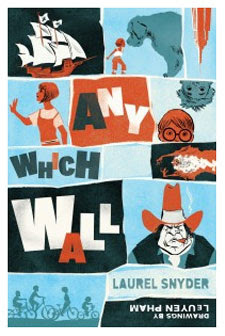 Any Which Wall is a creative, imaginative summertime children's book. Because of the setting, I'd especially recommend it to children living in the Midwest, though children living anywhere will appreciate the adventure. Snyder wrote Any Which Wall as kind of a tribute to Edward Eager. To be honest, I've never read Eager. [GASP!] I'll blame that little oversight on not meeting a Lily the librarian as a child. Lily is the exotic and slightly peculiar orange clog, fork-in-her-hair wearing librarian that the children befriend in Any Which Wall. Readers do not need to be familiar with Eager's works to enjoy Any Which Wall. Anyone with an interest in magical fantasies (Harry Potter and the like), unicorns and time travel will find something to love about Snyder's book. She lures readers into the story with a short note on common magic, the kind of magic that takes place every day, the kind you'd miss if you weren't looking for it. She convinces readers that extraordinary things can happen to an ordinary person. (Yes, watching fireflies blink in unison is magical.) For those concerned about such matters, the beginning of the book does depict the children performing a "fun" sacrificial ceremony to the spirits of the field. It plays such a minor part in the mostly innocent book, a book that mentions creating music using a blade of grass and includes several light-hearted messages including "you have to be careful of strangers and of cake, even the kind that comes from nice librarians." The black and white illustrations drawn by LeUyen Pham show some of the unusual situations the children encounter. As a bonus, Snyder has included a secret message somewhere in the book for curious children to find. Someday I will let my children read the book, so long as they promise to never, ever use my toothbrush to clean filthy objects. Fireflies are magical. I love watching them all. Thanks for the great review. I've seen it around but didn't know much about it. It sounds like a really fun book. That sounds like a great book. Although, I don't have any kids at that reading level right now. I used to love getting fresh sweet corn in the summer time as a kid. Sweet corn festivals are also a lot of fun.